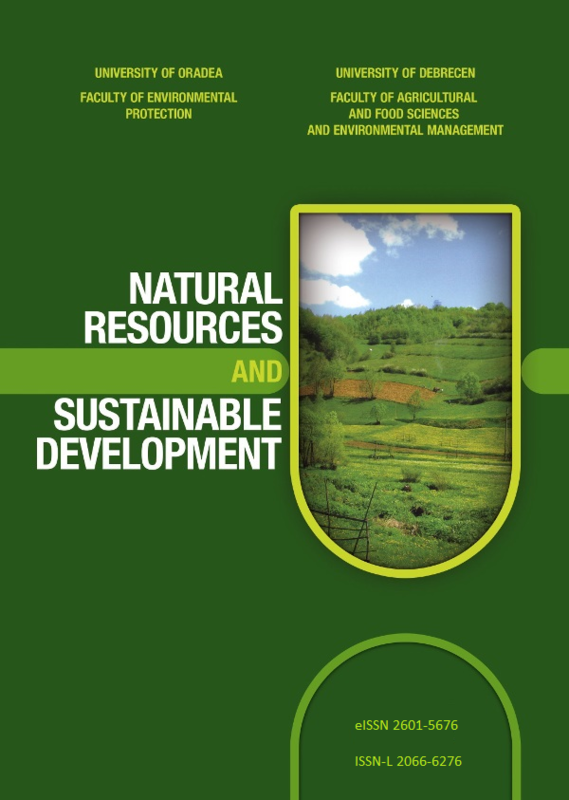 The language of the Journal Natural Resources and Sustainable Development is exclusively English. Contributions will be considered only if they have not been previously published or been submitted elsewhere. The manuscripts must be submitted only in electronic form. Receipt of a contribution for consideration will be acknowledged immediately by the Editorial Office. The acknowledgement will indicate the paper reference number assigned to the contribution. Authors are particularly asked to quote this number on all subsequent correspondence. The manuscripts are subjected to preliminary evaluation by the Editorial Board, after which they are forwarded to the appointed referees (blind peer-review). 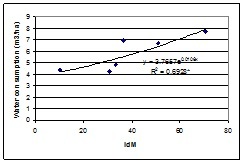 The period of paper evaluation is maximum two months. In case of a negative report, the manuscripts are sent back to the author. This file provides a template for completing the article for the journal. 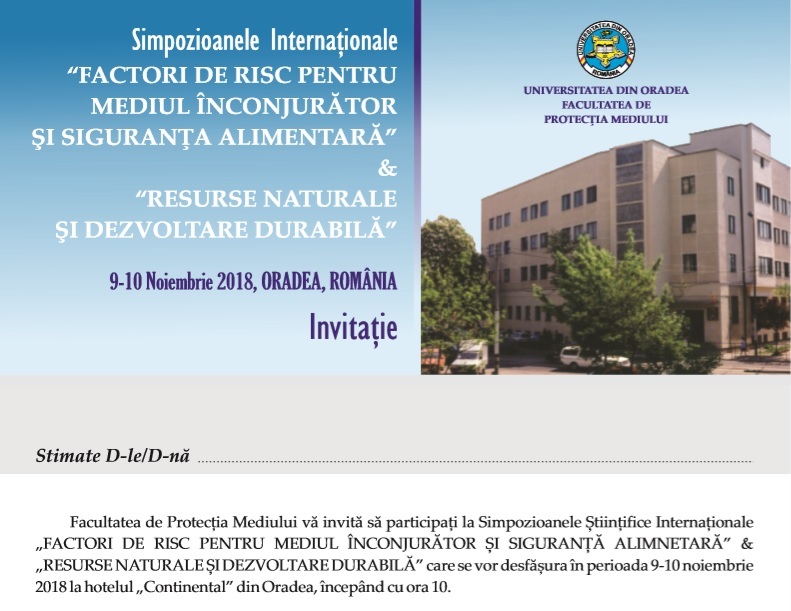 The journal will be published at University of Oradea Publishing House. The manuscript in MS Word format will be written in accordance with the guidelines in this template. The author will not have to do anything, only to replace the headings and paragraphs without changing the format presented in this template. The entire article will be written in English (the abstract will have 150 - 300 words). It is preferable that authors to submit their article carefully written and checked. Materials submitted with spelling and grammar errors will not be accepted. They must present the results as concisely as possible. The article shall be written in such a way that its reading to be as smooth as possible. This can be achieved if you will strictly follow the format required through the present template. Please note the following details: this template is an MS Word file A4, with top and bottom of 4.5 cm, and the left and right margins of 4 cm. The Header and Footer is of 3.7 cm. All the paragraphs should be written at single space, the first line having a paragraph (tab) of 1 cm. Position and character titles and subtitles will follow this template. Do not leave spaces between paragraphs. By using this template, the margins, header and footer will be set automatically so that the author must only replace the authors’ names and the paper title on the first page footer, using this template. The article will be edited in Times New Roman (TNR) 12. 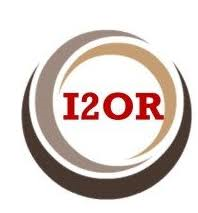 The indices and exponents will be edited in TNR 10. For the text inside the figures, it is recommended they should not be smaller than 10. The papers should include original data and they should be edited only in English, in Word, single spaced. The figures and tables should be named so that there is no need to refer to that text of the article. They will be mentioned in the text between brackets (Fig. 1) or (Table 1). The figures and tables that are not cited in the text should not be presented in the article. The tables and figures will be introduced after they are mentioned in the text. All figures and tables will be numbered using Arabic numbers, as in this example. The name of the tables is edited above the table, with right alignment. The name of the figures is edited bellow the respective figures, with centered alignment. The bibliographic references from the text will be marked in brackets, for example (Sabău et al., 2010) or (Nagy, 2010; Șerban, Dragotă, 2013; Sabău et al., 2010). The references should appear in alphabetical order. A few examples of bibliographical references are presented below. The research was carried out in the project: PN-II-ID-PCE-2008; 1103/2009 ”Study of the relationships........”. Manuscripts should be submitted only in electronic form. Submissions sent in a different way (e.g. e-mail) may face a delay in publication. All text (including the title page, abstract, keywords, all sections of the manuscript, figure captions, and references) and tabular material should be in one file, with the complete text first, followed by the tabular material. The manuscript must be prepared using MS Word 6.0 and above. Manuscripts in PDF are not accepted. Before submitting the manuscript (scientific article), please carefully read the bellow Natural Resources and Sustainable Development ethical and publication malpractice statement. In order to avoid any type of publication malpractice, each manuscript must be accompanied by theNatural Resources and Sustainable Development Cover Letter, fully completed and signed by all authors. The submitted manuscript must represent the authors’ original work. The manuscript submission to several journals in the same time is not permitted. Manuscripts with any type of plagiarism will be automatically rejected and the authors will lose the right to further submit and publish in the Natural Resources and Sustainable Development journal. If the authors try to republish an already published paper (using their own or other authors data) the editors of the Natural Resources and Sustainable Development journal will inform the editors of the other publication(s) of the original paper, the funding agency (if the case), the institution and also the reviewers. The Cover Letter stipulates the ethical issues and must be signed by all authors. It must accompany the manuscript submitted to the Natural Resources and Sustainable Development journal, otherwise it will be automatically rejected. If the manuscript does not comply the on-line published publication requirements and guidelines or it does not meet the aim and scope of the journal, the Natural Resources and Sustainable Development editors reserve the right to reject the manuscript without blind peer-review. Each paper will be sent to at least two independent reviewers. If major discrepancies are recorded between the two reviewers, a third reviewer will be asked to review the manuscript. The journal editors will decide the acceptance or rejection of the manuscripts according to these reviews. The manuscript submitted for evaluation (including text, figures etc.) remains in the property of the Natural Resources and Sustainable Development, being subject to the copyrights laws. If the article is rejected, the property right of all materials goes back to the authors. The reproduction, posting, transmission or other distribution or use of the article or any of its parts requires a reference to the Natural Resources and Sustainable Development. Plagiarism is the exposing of another person’s thoughts or words as though they were your own, without without permission, credit, or acknowledgment, or because of failing to cite the sources properly. Plagiarism can take diverse forms, from literal copying to paraphrasing the work of another. Paraphrasing involves taking ideas, words or phrases from a source and crafting them into new sentences within the writing. This practice becomes unethical when the author does not properly cite or does not acknowledge the original work/author. This form of plagiarism is the more difficult form to be identified.